Don Muehlich, 82, of Schuyler, died Monday, June 12, 2017, at Brookstone Acres in Columbus. Donald Lee Muehlich was born January 28, 1935, in Fullerton, Nebraska to Harold and Violet (Frederick) Muehlich. He graduated from Schuyler High School in 1952. He served in the United States Army from 1954-1956. On February 16, 1957, Don and Joan Oehlrich were married at the Federated Church in Columbus. They lived and farmed near Rogers, Nebraska where Don also fed cattle. Don was a pitcher and 3rd baseman for the Schuyler Merchants for many years and played softball following his baseball career. He was a member of the Schuyler Masonic Lodge, Christ United Methodist Church for over 50 years, Schuyler American Legion, and past Director of First National Bank in Schuyler. 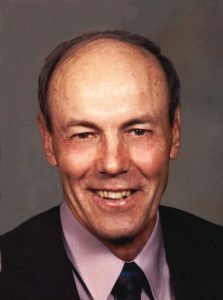 Don also served as President of the Schuyler Memorial Hospital Board, Schuyler School Board, School Board of District 4R and past President and Treasurer of the Colfax County Livestock Feeders Association. He had served as Director and Treasurer of the Platte Valley Cattlemen's Association and in 1995 was awarded Cattleman of the Year award by that organization. Don is survived by his wife, Joan of Schuyler, two daughters; Dawnn (John)Reid of Omaha and Lori Williams of Wilsonville, Oregon, one son Jon (Sue) Muehlich of Rogers, two brothers; Leon (Adair) Muehlich of Schuyler and Bob (Kathie) Muehlich of Omaha, a sister, Karen (Roger) deBrown, Lincoln, and five grandchildren; Jonathan(Breanne) Muehlich of Schuyler, Kelly(Lawrence) Scholl, Omaha, Rachal (Stan) Schulte, Lincoln JC (Angie) Reid of Omaha and Libby Williams of Corvallis, Oregon, as well as many nieces and nephews. He was preceded in death by his parents.